FANBOY PLANET.com . : df-behindSNL :. With this fall season coming to a close, NBC has invited its viewers to share an additional hour and a half a week to consider why Saturday Night Live just isn’t funny anymore. Now that we’ve had a chance to see what these two shows have aspired to, it’s time to do some serious comparison. Studio 60, a new hour-long drama by Aaron Sorkin (head writer of The West Wing) starring Matthew Perry (Friends) and Bradley Whitford (West Wing) has been put up on Mondays at 10pm, accompanied by 30 Rock, a new half-hour comedy written by Tina Fey (star and head writer of SNL during the last five years or so) and starring her and Alec Baldwin. First let’s look at what these shows have in common. They’re both fictional stories about the production of an SNL-esque show. They both focus on the role of head writer. Both head writers have a sort of romantic difficulty. They are both written by seasoned television writers, and they’re both on NBC. But that’s about as far as the similarities go. When an episode of 30 Rock begins, you’re swept up in a version of New York City that feels slightly inflated into an almost cartoonish version of itself. The colors are a little brighter; the clothes are a little cleaner; it’s almost a toned down version of Ugly Betty. 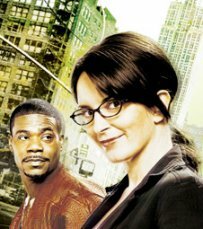 The show is filled with ridiculous caricatures, with Tina Fey playing the quixotic ringleader straight-man in the eye of the storm. The show’s co-star Alec Baldwin plays some sort of network higher-up. He is always wearing a tuxedo or formalwear, and always has some tightly encoded advice, which tends to circulate around “pull your own weight” and “dump that loser boyfriend.” As far as the show-within-a-show goes, we mostly just see Tina try to pull her insane cast together enough to get out on stage that night. Studio 60 has a more sophisticated vibe. With its sleek night-logo and clean theme song it feels more like an episode of 24 than SNL. The first two episodes establish that the show had grown politically stagnant, and in an effort to regain their street cred, as her first act as Network President of “NBS,” Jordan McDeere (Amanda Peet) hires Matt Albie (Matt Perry) as writer and his buddy Danny Tripp (Bradley Whitford) as producer. The episodes have all taken a trip through some touchy issues, from gay marriage, racist ghettos, religion, the Iraq War, to most recently, a touching ode to New Orleans. The show is composed largely of fast-paced witty banter, arguments, stereotype bashing, and chasing the muse of the next sketch. In my introductions I’ve no doubt betrayed my opinion. I find Studio 60 far more enjoyable than 30 Rock. And I’ll explain why. When I watch 30 Rock, I see a lot of madness, but not madder madness than is on SNL already, and a lot of it feels self-indulgent. Tina Fey wrote herself into Saturday Night Live as the only sane person. While never touching on her writing style, her role here seems just run into one of her stars, who has some absurd emotional distress, watch her roll her eyes and give reluctant courtesy help to these pathetic souls who don’t compare to her in their commitment or ability. In Studio 60, the characters all have strengths and weaknesses, and we can see them progress from episode to episode. There’s a continuum and an evolution, and it’s all developing. We get to see them tackle big problems together, with no lack of mocking each other, or of witty retorts, but at least it isn’t one-sided. In 30 Rock, a mistake a character commits one episode (Botox injections?) is reset by the beginning of the next episode without any explanation. Which makes the whole show take place in this vacuum of duty-free absurdity where the only problem is an excess of ZANY! It’s like watching a drunk guy yelling, insisting that what he’s saying is hillarious, and if he just yells a little louder it’ll only be funnier. There have been some moments, however, when sharing Studio 60 with a friend that I almost felt embarassed for a scene or two. While around half the show focuses on their writing issues and intelligent debate, the other half thus far has rested on a rather simple relationship tug-of-war between Matt Albie and Harriet Hayes. I’ll sum it up: Matt is a cynical liberal, while Harriet is a wholesome Christian. The show used to be great because he saw what made her beautiful and wrote to impress her, and that made them both famous. Then she got too Christian by singing for the 700 Club, and he can’t forgive her, so they’re apart. It’s probably self-glamorizing. It’s been well discussed on the internet that Harriet Hayes’s character is based on Kristin Chenoweth and their relationship while working on The West Wing. This might just be Sorkin’s way of saying he ended it because he’s so enlightened, when we don’t really know how it happened. Just during the last Christmas episode has their been an implication that this dynamic would shift, when they finally kissed, and Danny told Jordan he loved her after she tested positive for pregnancy. So it might look like my least favorite dynamic of the show might be taking a bigger place. Let’s hope it all keeps moving and interacts with the show-within-a-show. Because the show is about making the show-within-a-show. And that’s a lot of fun. Too bad Tina Fey doesn’t have any experience writing quality TV, or her show might be interesting, too.